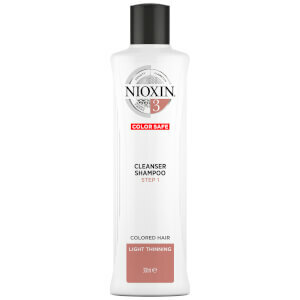 Prepare the scalp and hair for a comprehensive thickening treatment with NIOXIN 3-part System 1 Cleanser Shampoo for Natural Hair with Light Thinning. Step one of NIOXIN's 3-part treatment, the derma-purifying shampoo performs a deep cleanse, eliminating dirt and impurities to pave the way for healthier, thicker-looking hair. Formulated with Activ-Renewal™ technology (a concentrated blend of age defying botanicals and humectants), the shampoo helps to remove sebum, fatty acids and other environmental residues from the scalp and hair for fuller, youthful-looking results. Strengthening hair structure, the professional shampoo will leave locks looking healthy and amplified. Leaf Extract, Citrus Aurantium Dulcis Fruit Extract, Potassium Sorbate.